Details of arrest: Initial reports suggested he was accused of “blasphemy” due to the atheist content of his work and of “having long hair”. Court documents later showed that he was first arrested in summer 2013 because of a complaint that a citizen submitted to the Saudi Committee for the Prohibition of Vice and Promotion of Virtue. Allegedly, he was accused of “misguided and misguiding thoughts”. He was later released on bail and rearrested on 1 January 2014 on charges of “insulting the divine self” and “having long hair”. Current place of detention: He has been held in a prison in the city of Abha ever since his arrest. Details of trial: During his trial held over six hearings between February and May 2014, Fayadh stood accused of numerous blasphemy-related charges, including insulting the “divine self” and the prophet Mohammed, spreading atheism, refuting the Quran, and insulting the King and the Kingdom, among other charges. Evidence compiled against him included at least 10 pages from his collection of poetry Instructions Within, published by the Beirut-based Dar al-Farabi in 2008 and later banned from distribution in Saudi Arabia. Also used as evidence against him were Twitter posts, and conversations he had had in a coffee shop in the city of Abha, where he lived. Fayadh was also accused of having illicit relations with foreign women for having images on his mobile telephone. Witness testimony reportedly claimed that the complaint submitted to the Saudi Committee for the Promotion of Virtue was the result of a personal dispute. During the last session, Fayadh expressed repentance for anything in the book that religious authorities may have deemed insulting, stating, according to trial documents, ‘I am repentant to God most high and I am innocent of what appeared in my book mentioned in this case’. According to court documents, on 30 April 2014,the General Court of Abha found proof of Fayadh having committed apostasy (ridda) and his repentance for it. The court therefore ruled to lift the penalty for apostasy, however, it sentenced him to four years in prison and 800 lashes – to be administered 50 at a time every 10 days – for storing images on his mobile telephone, and the confiscation of his telephone. On 17 June 2015, the General Court of Abha sentenced Fayadh to death for the crime of being an infidel (kufr) following a re-trial. The court argued that Fayadh’s repentance for the crime of apostasy was a matter of the heart and should have no bearing in determining whether or not the crime had been committed. On 14 December 2015, news reports suggested that he was appealing his conviction. Reportedly, the appeal states that the accusations of public blasphemy and promotion of atheism are uncorroborated. 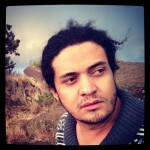 Firstly, the religious police officers detained Fayadh following the testimony of a man who had personal disputes with the poet and without corraborating evidence. In second place, his lawyer suggests that he also converted several people to Islam and finally, that the judge did not regard Fayadh’s mental illness. Conditions in detention: According to PEN’s information, he has been ill-treated in prison, he has been denied family visits and phone calls. Background: Fayadhis a member of the Shattah group which illustrate the new generation of artists in Saudi Arabia and has been engaged in well-known exhibitions of contemporary art. He also curated London’s Edge of Arabia exhibition and co-authored Rhizoma a book that exposes the transformation of arts scene in Saudi Arabia. The work upon which authorities are charging him is a collection of poems he published in 2008, entitled Instructions Within. Mona Karen, a Bedouin human rights activist from Kuwait who has been advocating for Fayadh’s release, suggested that he may be imprisoned due to the publication of a video of Abha’s religious police lashing a young man in public. Other information: On 11 February 2014, one hundred intellectuals of Arabian countries issued a petition demanding Fayadh’s release. In addition, there has been a significant support and campaigning through social media. Mona Karen, has been engaged in a translation movement for Fayadh’s work. She translated a poem entitled, ‘Frida Kahlo’s Mustache’ and the poem ‘Asylum’. On 3 December 2015, the UN Office of the High Commissioner of Human Rights released a statement urging his release. PEN Action: RAN 13/15 press statement 27 November 2015, joint letter by writers worldwide, participation in global poetry reading of Fayadh’s work on 14 January 2016.